Congratulations! You are on the path to a healthier lifestyle. But how do you eat healthy when all you have time for is quick convenience foods? Understanding the ingredients list on food labels of prepackaged foods is an important part of learning to make healthy choices. Some foods contain ingredients with complicated names that sound like they belong in a chemistry lab, not on your plate. To make matters even more confusing, the advertising of some products can be misleading, making you think their product is healthy when, in reality, it is laced with sugar, preservatives and/or trans fats. Ingredients ending in “ose” are all forms of sugar (fructose corn syrup is a complicated name for a cheap artificial sugar). Sodium has many names: salt, sodium benzoate, disodium, sodium nitrate or monosodium glutamate (MSG). Avoid all foods with vague ingredients like “natural flavors” or “spices”. These terms are used to avoid revealing the actual content of the food so you don’t know exactly what you are consuming. Enriched and bleached flours are different ways to say white flour. Foods that claim to contain whole grains or multi-grains tend to have more sugar then grains. The longer the ingredient list, the more processed the food. Propyl Galate is an artificial food additive that is banned in other countries as it can cause severe allergic reactions as well as kidney and liver problems. Benzoate is a food preservative that deprives our body’s cells of oxygen and is suspect for causing cancer. Choose products with short ingredient lists of foods you would normally eat individually or cook with at home. Stay away from products with partially hydrogenated oil and high fructose corn syrup. If a product is advertised as “whole grain” or “muti-grain” the first word in the ingredient list should be “whole”. To double-check the “whole grain” quality of a product, the fiber content under the Nutrition Facts should be at least three grams of fiber per serving. 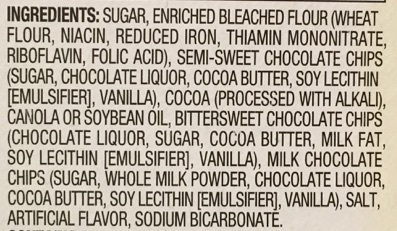 Avoid any product that has the word “artificial” in the ingredient list. Whenever possible, purchase products with the USDA Certified Organic seal. Here’s another great resource: The international food information council foundation’s “What’s in Our Food: understanding common food ingredients” defines some common processed food ingredients. This entry was posted in grocery shopping, Nutrition and tagged healthy choices, Healthy foods, ingredient labels, labels, Nutrition, understanding food labels. Bookmark the permalink.